Bored dogs are barking dogs. In many cases, if you want to know how to stop dog barking, all you really need to do is find a way to occupy your dog. If you need to keep your dog occupied while you're away from home there are many great tricks you can use that will give him hours of entertaining fun, and even give him a great mental workout. Kong Toys: Kong toys are a great way to entertain your dog, and are insanely tough in the face of some pretty nasty chewing. They hold up marvelously to some real canine punishment. But they have another benefit when it comes to keeping Fido on the lowdown while you're away. Kong Toys can be filled with moist food and frozen. This produces hours of fun followed by a yummy snack. Try freezing several Kongs with different snacks you know your dog likes, and hide them around your yard or house while you're away. If your pup doesn't feel like one snack, he'll appreciate the other. You'll love the Kong trick and your neighbors will love you for buying it. Food Balls: When looking for how to stop dog barking, food balls are another great way to keep your dog busy and minimize barking problems. The food ball, at first glance, appears to be nothing more than a regular ball. But, it will quickly become your dog's favorite toy. As your dog rolls the ball around with his nose, the ball dispenses treats one by one. Your dog will have a blast bumping the ball around the house or yard, waiting for those treats to pop out. This toy will challenge your dog's mind as well his stomach, and best of all, it will keep him quiet for hours while you have to be away from home. Perhaps you might want to try giving your dog a food ball and a Kong toy to see which he prefers. When it comes to snacks, he might prefer both! Rawhide Treats: Of course, an old standby when you're trying to keep your dog occupied is the rawhide treat. A dog can chew a rawhide for hours and still not get to the end of it. Aside from being great for keeping your dog active while you're away and keeping her barking to a minimum, these treats have other benefits. Rawhides give your dog much needed exercise for her jaw. And I don't know about you, but I'd rather have my dog exercise with a rawhide than with my best pair of shoes. Plus, rawhides are a wonderful tool for doggie dental care. Ice Licks: This great tool makes use of the toys your dog already has and loves. It's especially perfect for a really hot summer day when you have to leave your dog at home. The principle is simple. You put all your dog's favorite toys in a bucket mold, or Teflon container and freeze them solid. Then, before you leave, you put the frozen block of toys on the lawn base and stick the lawn base into your yard. Your dog will spend many quiet hours licking until, one by one, their favorite toys start popping out of the ice. One at a time they'll have some great fun with one of their toys and then move back to the ice lick to free another. An ice lick isn't just about how to stop dog barking, it's a great way to keep a dog cool and hydrated. Plus, he'll have loads of fun. There are a lot of tips and tricks to getting your dog to quiet down while you're away. You just have to do some looking to find which one works best for you and your pet. 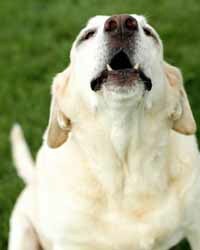 These tricks may be just what you're looking for if you want to know how to stop dog barking.